1) Are there 2 or more women in the film who are named? 3) Do the women talk to each other about something other than a man? I became aware of this test last spring, and I really like it because not only do shockingly few movies pass the test, pointing to the systemic gender problem in Hollywood, it is also quick and straightforward. Somehow when I try to talk about gender roles or the lack of scripts presented to women in film, it can turn into a debate. This test is three simple, yes or no questions. The last two movies I watched failed the test: Inception and Where the Wild Things Are. Both are amazing movies in their own right, and I enjoyed both exceedingly. But they did fail the test. Noted. Now, I will grant you that in the latter most of the characters are not actually human. But it still didn’t pass. There is a mother and a daughter in the film. The mother is not named, and she never talks to the daughter in the movie. 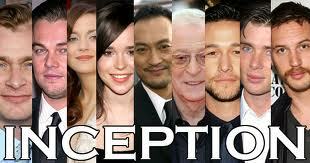 Inception has a plethora of gender issues, but I will avoid a deep analysis by saying it also failed. There are two female characters, but I only caught one name, and they only talk to each other about Leo’s character. Give it a try next time you watch a movie. I have found that it is an easy way to be media savvy, to be able to simultaneously love a film and want more for women from Hollywood.